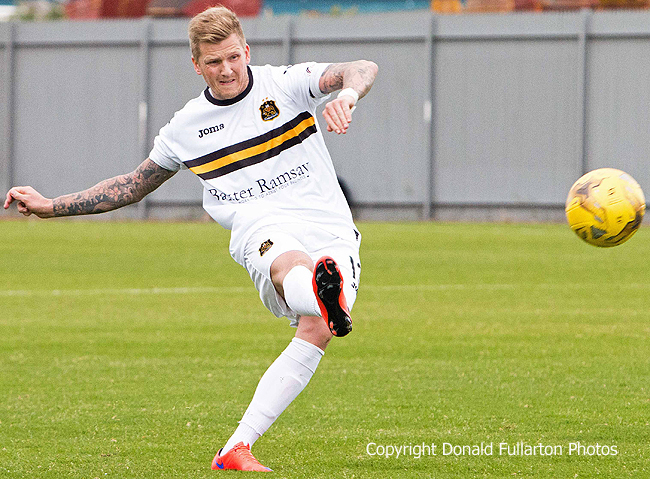 DUMBARTON produced a stunning opening to the SPFL Ladbrokes Championship with a 2-1 home win over title hopefuls Hibs. DUMBARTON produced a stunning opening to the SPFL Ladbrokes Championship with a 2-1 home win over title hopefuls Hibs in front of a 1,500 crowd. It was a deserved victory for Stevie Aitken's part-timers over the Edinburgh side managed by Alan Stubbs, whose much-vaunted full-time players were stifled by committed and intelligent defending by the home side. After only three minutes centre half Gregor Buchanan poked home a Willie Gibson free kick to open the scoring, and Garry Fleming (twice) and Steven Craig had chances to widen the gap before Dominique Malonga equalised when Andy Graham slipped as he tried to clear. The first half ebbed and flowed, but Sons grew in confidence as they battled on. Rangers target Scott Allan did little to impress, with Fraser Fyvie much more active in midfield. The second half was even until a foul on Kevin Cawley gave Willie Gibson a chance from a free kick outside the box, and he bent it round the wall and into the net for a sensational score (pictured). It proved to be the winning goal, as the home side held out comfortably for a great opening day win.